Kasco’s 8400JF decorative fountains are the perfect way to beautify any mid-to-large size pond or lake. This versatile fountain comes with six interchangeable nozzle heads giving you the option to choose and change the spray pattern as you wish. 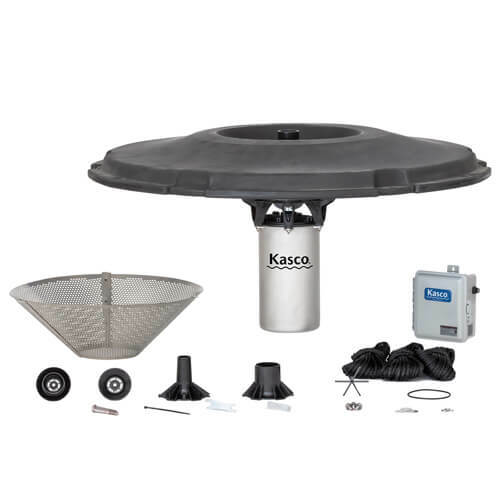 Kasco also offers premium nozzles for the J Series Fountains available separately. Optional lighting packages are available to extend the visual impact of your fountain into the evening hours. These units are available in a variety of power configurations including 240V single phase (60Hz), 240V & 460V three phase (60 Hz), 220V single phase (50 Hz), and 380V three phase (50 Hz). These easily installed fountains come complete and ready to go with everything you need to add beauty and drama to your water.